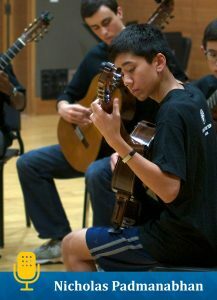 Nicholas Padmanabhan, a student at the Palo Alto High School, has played classical guitar for nine years and frequently performs in both formal concert venues and community outreach programs. You may have first heard him when he performed with the San Francisco Conservatory Guitar Quartet on NPR’s From the Top with Host Christopher O’Riley on Show 301 in San Francisco, California, at age 14. Back in March of this year, Nicholas had the chance to speak at a TEDx event at his high school (video) and decided to use the opportunity to share the classical guitar with his community. Below is his story. “As a ninth-grader at Palo Alto High School in Palo Alto, California, being chosen as a TEDx speaker at was high on my list of most unexpected outcomes. But I’m so glad I had the opportunity to speak about a subject I’m really passionate about: music! When I first heard last fall that my school would be organizing a TEDx conference, I thought that giving a TED talk would be a fantastic way to bring classical guitar music to my school. Although the music department at my high school frequently has band and orchestral concerts, classical guitar performances are extremely rare. However, I knew that I didn’t want to just play music and be done; I wanted to also give a talk about bringing music out of concert venues and into the community. I’d learned about this in arts leadership training when I was on From The Top in San Francisco last year. Basically, for my TED talk, I wanted to both preach what I practice and practice what I preach. So, in December, I auditioned for the TEDx student organizing committee by playing a short piece for them and outlining the ideas for a speech. They liked my audition! I was invited me to speak at the TEDx event (check that off of my list of most unexpected outcomes). Then, I started with the real work of deciding my repertoire and composing my speech. First, I picked out two contrasting pieces (which, for some reason, reminded me of music competitions) so that I could show the audience some variety in classical guitar pieces. I decided on a Courante by Bach and the Tarantelle by Hungarian composer J.K. Mertz. Next, I set to work on planning the speaking part. I wanted to convince my audience about music’s important role in people’s lives. I thought about some of the individual informal performances I do for an assisted living center near my house. I also spent a lot of time thinking about all I learned in From The Top’s arts leadership program and the musical outreach events I had done with the show. I wanted to talk about how we performed for the kids at Jefferson Elementary and Malcolm X Elementary School in San Francisco and how those outreach events are perfect models for spreading music to more people. Watch Nicholas speak and perform at TEDx below, or by clicking here. Thanks for reading, and don’t forget to subscribe to our blog by entering your information on in the box on the right!